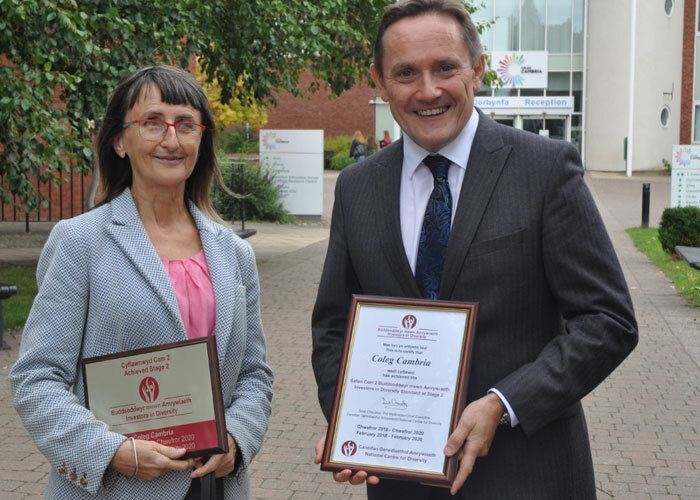 North Wales college Coleg Cambria has been recognised as a pioneer in equality by a leading rights organisation. The college was awarded the prestigious Investors in Diversity Stage 2 by the National Centre for Diversity (NCFD). The accolade came after Cambria’s CEO David Jones was shortlisted at the 2018 NCFD Awards in the UK Managing Director/Chief Executive of the Year category. Led by Equality and Diversity Coordinator Elane Roberts, staff and students displayed a culture of care and inclusion, introducing practices and EDI (Equality, Diversity and Inclusion) legislation that held them up as a beacon of best practice. Elane said the welcoming environment at all five Coleg Cambria sites makes it a pleasant place in which to work and learn. “You can have policies in place but it’s the practice, training and behaviours that count,” said Elane. “It is everybody’s responsibility – from the caretakers to governors, students, teachers, managers and the principal – to ensure equality and diversity is at the centre of everything the college does, creating a fair, respectful and safe environment to work and study in. We do not just pay lip service, we recognise its importance to our daily lives. “The college works hard to ensure that everybody is welcome on arrival, no matter what their background, faith, ethnicity, sexuality or ability. It then endeavours to ensure that this ethos remains whilst they are studying and working here. “Coleg Cambria is in the business of educating but that’s not limited to the classroom. “We recognise the world is very diverse, that mental health awareness and wellbeing is crucial, and together we are trying to make a difference in collaboration with partners and student representatives. The Investors in Diversity Award and Leaders in Diversity Award are recognised as more than just highly prized and prestigious national equality standards. They provide an all-encompassing methodology for improving EDI practices in the workplace. “Those that achieve our national equality standards have been enabled to take a structured and planned approach to embedding EDI at the heart of what they do.